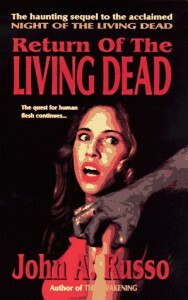 A huge fan of the 1968 film, Night of the Living Dead, I was fairly certain I’d enjoy this book. And Return of the Living Dead was a fun reading experience.There was ooey gooey graphic consumption of human flesh, emotional turmoil, and the living acting like *they* were the brain dead ones. Mostly, I enjoyed Russo’s ability to go one step further to make the situation that much worse for the characters just when I thought it couldn’t get any worse.